With Wollongong’s local bug hero, professional cockroach control is just a phone call away! Cockroaches may be the most unpleasant of all common household pests. When they aren’t contaminating your food and belongings, they’re destroying your appliances and breeding at an alarming rate. Before you know it, they’ve colonised your home and are spreading your neighbours! If you need professional cockroach control in the Wollongong area, turn to Miller’s Pest Control. Our modern methods and Cockroaches can breed rapidly and are highly resilient. A quick response is essential to prevent cockroaches in your home or building. Does one cockroach mean infestation? Not exactly, but one living roach is all you need to be concerned. Because cockroaches breed so rapidly, their numbers can get out of control before you know it. Don’t take any chances! Exterminate roaches as soon as they appear – and if you keep seeing them, it’s time to call in the professionals. Millers are the experts in cockroach extermination and prevention of re-infestation. Call us today for a free quote on roach control, or check out our effective treatments for other household pests. 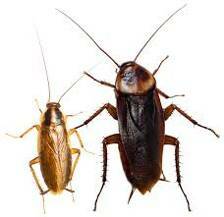 Roaches are notorious for contaminating their surroundings, especially food, benches and utensils. In addition to being unsightly and frustrating to clean, their leavings facilitate a range of serious illnesses including salmonella, dysentery, and gastroenteritis. Cockroaches can create an obnoxious odour in high concentrations, and also trigger allergic reactions (like asthma) in sensitive individuals. Roaches can also be surprisingly destructive! Their love of enclosed spaces often leads them to enter electrical appliances, which often damages or destroys their function. They are also attracted to paper, and will leave permanent marks on books, photos and other documents near their lairs. This makes cockroaches a much more costly pest than many people expect! In addition to everything else, many people find the roaches themselves to be a disturbing or embarrassing sight. This is one pest that everybody wants to get rid of as soon as possible! Be especially vigilant when the weather turns warm and humid. Hot weather allows roaches to breed faster and spread further, so infestation can occur even more quickly than normal. In the Wollongong region, the humidity often stays high all throughout the summer months. Once you have an infestation, there’s not much you can do to get rid of cockroaches without an exterminator. Although there are a number of domestic products available, the only reliable solution is a thorough, professional treatment. Not only will you get better, longer-lasting results, you’ll safe on your own time and labour. Trying to get rid of roaches yourself is a serious amount of work! At Miller’s Pest Control, we use safe, professional pest control solutions to clear up your cockroach infestation. Our odourless, kid-safe and pet-safe treatments are designed to attack roaches efficiently and unobtrusively, so you can have your home back as quickly as possible. Gel-based treatments around habitat areas: cupboards, electric motors and appliances, cracks & crevices. Powder-based treatments in roof voids and cavities, where frequent contact ensures many individual roaches will be affected. If you have problems with other household pests, you can also read about how we deal with other types of insects. It’s important to understand that cockroaches are very common, especially in hot weather. Seeing roaches doesn’t mean your home is dirty or dangerous! The most common mistake is simply not eliminating roaches as soon as you start seeing them. That said, being aware of what causes a cockroach infestation is your best bet to keep these pests out of your home for good. These tips will help you stop the occasional cockroach sighting from developing into full-blown infestation! Keep your floors clean, especially around the kitchen, lounge room, and laundry. Pay special attention to cleaning around electrical appliances, as cockroaches love to get inside small, narrow spaces. Check your bags before leaving work. You can accidentally bring one home with you, especially if you commute to Wollongong CBD or Sydney city. Try to minimise warm, humid areas in your home, as these encourage cockroach activity and breeding. Caulk up cracks in joins and brickwork to minimise available habitats. Avoid storing cardboard or plastic near electrical appliances. If you see one cockroach, don’t let it live! Miller’s deliver fast, effective cockroach extermination across the greater Wollongong area. Call (02) 4276 4574 or 0430 634 503 for your free quote today!